Intuitive interaction and interface design: We have grouped the features and made navigation easier. Fast access to latest activities: New tools to help you monitor your students' activities. Single student assignments: You can assign cyber homework and content to single students. Of course, assigning cyber homework to groups of students will still be possible. My resources: You can add information and learning material to any course. 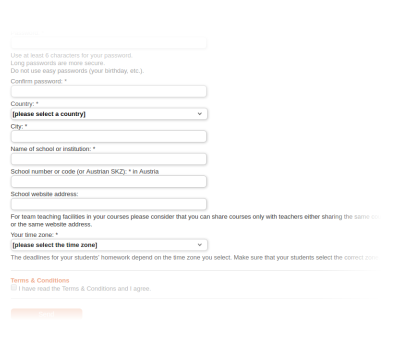 Student-managed accounts: Students manage their accounts independently and use one account for all their courses. Team teaching: You can manage the course with other teachers in your school: working as a team, you can share access to it, assign homework to students, check the results and share messages with the students in the course. Comprehensive course reports: Detailed reports about the activities of each individual student. Flexible messaging systems: You can exchange information with your colleagues, groups of students or individual students. 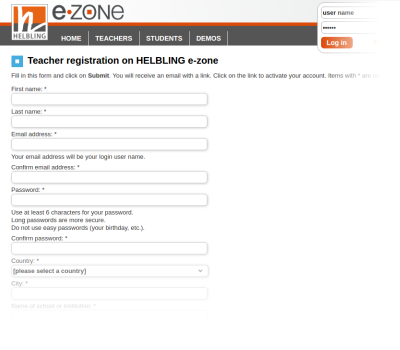 Click on Teacher registration and fill in the registration form. You will receive an email with a link. Click on the link to activate your account. If you don’t remember your password, click on Forgot your login data. Enter your email address and click on Submit. You will receive an email with your password.